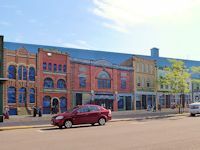 While it is the smaller, low-lying sibling of the Duluth-Superior Twin Ports area, Superior, Wisconsin has lots of things to do and see in Superior worth your attention. Most of the attractions are located along US Highway 53 coming from the east into town. If you are going to be in Wisconsin for a while, stop at the WI Travel Information Center, east of town near Moccasin Mike Rd. Otherwise plan to stop at the Visitor Information booth at Richard Bong World War II Heritage Center in Superior. It is located off Highway 53, on the lake near Barkers Island. This is also a good place to park if you plan to hike or bike along the Osaugie Waterfront Trail. The Northwest Outlet, near the Bong Bridge, is one of our favorite stops to shop for good deals on camping gear and clothing. If a search for the world's best hamburger is something that lights up your eyes, there are a couple of grills and bars in Superior that you must visit. 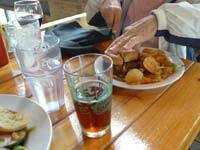 See them profiled in our Superior Wi See and Do attractions page. An increasingly popular event in both Duluth & Superior is the Superior Dragon Boat Festival held the last week in August. There are thousands of competitors as well as even more spectators. < < < The Osaugie Trail is a paved 5.2 mile long walking trail traveling along the Superior and Allouez Bays of Lake Superior. While you get some good exercise walking the lakefront trail, serious hikers should investigate the trails at nearby Pattison or Amnicon Falls State Parks. See the aforementioned Douglas County Travel Visitor Center and our links below for more info. 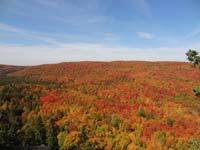 Hiking, Biking, Skiing, and Snowshoe Trails in Superior-Douglas County. 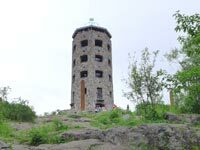 We crossed the Bong Bridge to travel to Duluth, Mn to continue our hunt for the best burger in the Duluth-Superior twin-ports area. See our reviews of the Hunt for the Best Burger in Duluth, Minnesota. Lake Superior Dragon Boat Festival is one of the top midwest dragonboat race and festivals. Apostle Islands Sled Dog Race. An entertaining family winter event celebrating its 23rd year. Ashland Mural Walk is an interesting attraction in nearby Ashland, Wisconsin. .